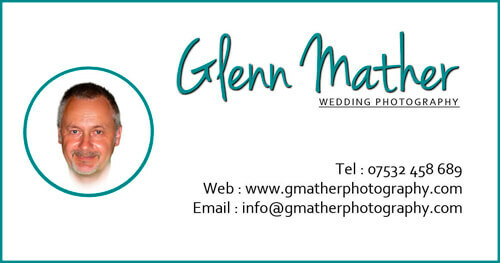 Glenn Mather Wedding Photography, combines a relaxed natural approach, with years of experience to produce a beautiful, timeless record of your wedding day; all at investment levels that will leave you pleasantly surprised. As a result I now have more independent Google reviews than virtually any other professional Wedding Photographers operating in Nottinghamshire, the East Midlands and beyond. If you looking for an experienced Nottingham Wedding photographer to tell the story your wedding day with relaxed, but stunning photography, then look no further and if you think you deserve the very best on your special day, then you really should take a look at my stunning "GOLD" package - the ultimate record of your wedding day. Many of my bookings come as a result of personal recommendations from previous clients who appreciate the beauty of my work, all undertaken in a non-intrusive, relaxed, documentary manner. Many have commented on how they had actually forgotten that I was there, but were amazed and pleasantly surprised at the wonderful photographs and memories I had captured for them. "This is your day - Not mine!" ...it's your wedding, not my photoshoot. Unlike some local wedding photographers who seem more interested in their own "portfolio"; I won't "drag" you away from your guests for over an hour. Just allow me 15~20 mins with you both and we'll get some beautiful photographs of the two of you for your album. Wedding photography is my passion and I take pride in telling the story of your special day through stunning images & beautiful wedding albums. Whilst I will of course take as many formal "Family & Friends" group photographs as you (and your grandparents!!) would like, the majority of the day I will be telling your story in a natural, unobtrusive manner, as you and your guests enjoy and celebrate your very special day. A wedding can sometimes be very hectic for the bride and groom and as a result they often "miss" many of the magical moments from their day. I capture many of these "missed" moments, so when they see their photographs for the first time, they genuinely re-live their wedding through new eyes - that often fill with tears of joy. Why not view more of my wedding portfolio on my gallery page. Operating as a local wedding photographer covering not just Nottingham, Derby and Leicester, but the East Midlands and beyond; so wherever you are getting married, give me a call if you want a stunning photographic record of your special day. My wedding photography packages provide a fantastic combination of "on the day coverage" at investment levels that will leave you pleasantly surprised; and of course, all include stunning images. Packages range from 2 hours, through to "all-day" either as "digital" only, a traditional full-sized wedding album, or have the best of both worlds by having digital copies of all your photographs PLUS a beautiful "Romantica" wedding album. Whatever you want from your wedding photography, I've got it covered. Check out all the fantastic packages by clicking the button above. If like me, you always read reviews before you purchase anything, then please do head to my testimonial page, where you will find a few words and comments from previous clients. The review's page also includes a "link out" to totally independent reviews by brides and grooms on "Google". Whilst I don't seem to find the time to up-date Facebook very often, you will also find a number of reviews of my services on my Facebook page. Click the button below to visit the "Reviews" page. Don't forget to check out the Client Reviews from real Nottingham couples. All our packages are flexible, maybe you need to add an extra hour to cover the wedding just how you would like - not a problem. Or perhaps you would like to include a couple of matching parent albums, again really not a problem. See our Extras / Options page for further information. We are located in Nottingham, but we cover the whole of the UK, often with just a nominal travel expense. Just contact us and we will be more than happy to discuss which package is best suited to your plans. Looking for some Wedding Planning Advice? Then why not visit our Wedding Planning page for great advice and tips on how to make your day a huge success. Have you ever had the thought that wedding photography is too expensive? or maybe considered getting a friend to do it for you? Well if you have you really should take a quick peep at why not hire a friend? You simply will not find a better combination of stunning work and great packages anywhere in the East Midlands or beyond.